If you travel along Australia's east coast you are bound to run into a cane toad race at least once during your travels. 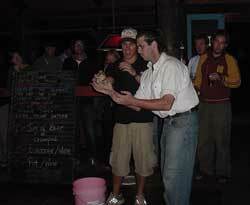 This is a report on the 19 June 2004 cane toad races at PK's Jungle Village in Cape Tribulation. First an introduction for those of you that have never heard of cane toads; they are a poisonous South American toad that can grow as big as dinnerplates and breed like rabbits. Australia nowadays has many introduced species of plants and animals, some manage to co-exist without too much impact, some create real environmental problems. 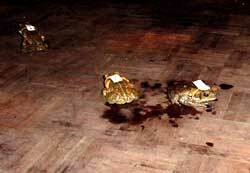 Most animals were brought in by your everyday people who had no idea what the consequences would be but the canetoad would have to be the biggest blunder in Australia's history as in this case scientists, paid by the Australian government, went overseas to collect canetoads and returned to Australia and set about thirty of them free in North Queensland in 1933. The idea was that they would eat the beetles that were causing economic damage eating the sugarcane but unfortunately the cane toads never touched the beetles but helped themselves to everything else they could find. Wildlife smaller than them they will kill and eat, wildlife bigger than them will eat them and die from the poison they have in glands on their back. 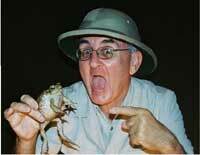 The thirty toads that were introduced initially have now multiplied into the countless millions and are spreading across Australia and have recently arrived in Kakadu, Northern Territory where it is expected they will devastate the place as there are vast floodplains which are the perfect breeding ground for them. They seem to be adapting to the Australian conditions/distances too, scientists are studying the toxic pests' entry in to the NT, clocking them hopping up to 2km in a single night, or more than 50km a year - five times quicker than their predecessors travelled in the 1940s to 1960s. Some birds have actually adapted and learned how to turn them over and eat their insides avoiding the poison glands on the back. 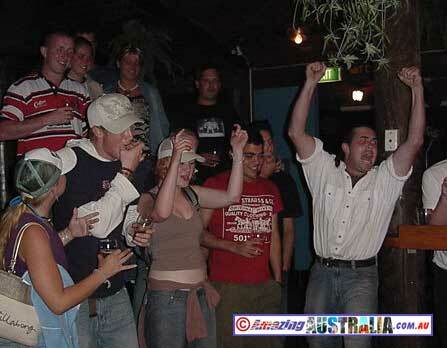 Ingenious Australians have also used the toads to make wallets, stubby coolers etc. 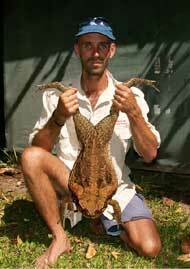 Western Australia is also concerned about the cane toad making it west across the Kimberleys, they have so far allocated $2.5 million and are currently training a sniffer dog that should detect and hunt down any cane toad that tries to make it across the border at Kununarra. The dog will be trained to search buildings and vehicles and if trials prove successful then more dogs will be trained. Hippies desperate for a thrill but too broke to buy drugs sometimes cut the back with poison glands off the toad, dry it in the sun and then roll it into a joint to smoke ( don't try this at home!!) Some dogs are reported to have turned into druggies by becoming addicted to "cane toad sucking", getting high on the poison. A vet in Katherine said she has treated more than 30 dogs suffering from the deadly effects of bufo toxin at her Katherine Vet Care surgery. In an effort to reduce the numbers of this toad Australians sometimes also get the golfclubs out for a round of cane toad golf. 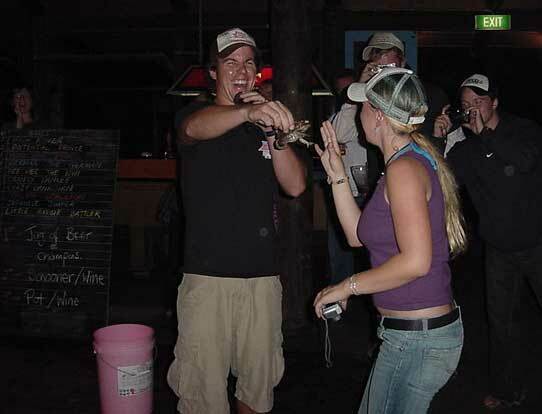 Australian pubs in tourist areas often organize cane toad races where punters can buy a toad or bet on them in similar fashion to horse races. 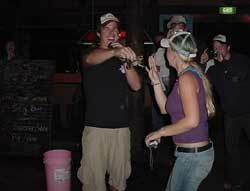 In the Northern Territory and in Cairns you can do your bit to save the country by collecting cane toads and being paid a beer per bag at collection depots. They are getting more huger! 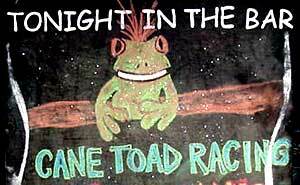 So how does a cane toad race work? Before the race someone is given the task to collect a bucket of cane toads. They are then fitted with a number on their back to tell them apart. The numbers correspond to names on the board you see above, to make it more internationally competitive they get names associated with countries and are then assigned to people from those countries that are picked from the audience. 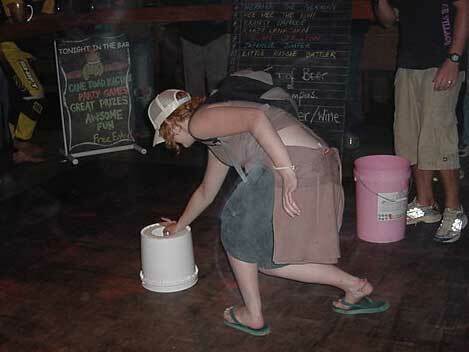 One by one they are issued their cane toad, instructed to kiss the toad, and place it in a bucket in the centre of the dance floor. 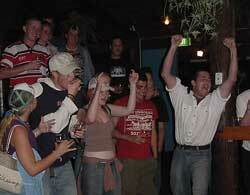 Then the bucket is lifted, the cane toads take off and the crowds go ballistic with excitement. 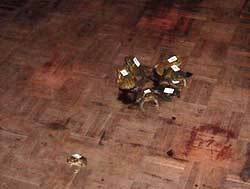 The first toad to leave the dance floor will be the winner. 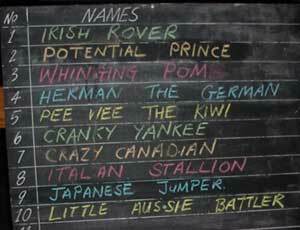 The owner of Italian Stallion won himself a jug of beer, the owner of Jumping Japanese a schooner of beer and the third over the finish line Herman the German a pot of beer. From time to time people get upset with this activity as they consider it cruel to the animal. Our view is that throughout the race the canetoads should be treated as you would any other animal, not too rough and not causing injury. 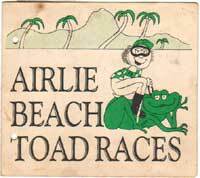 Then after the race you should dispose of your toads in a humane manner. 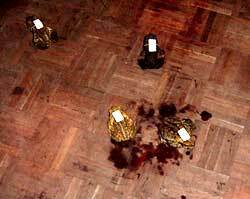 The suggested method for cane toads is to place them in a plastic bag in a freezer, where they will simply fall asleep in the cold and eventually pass away. Cane toads are one of the biggest environmental pess ever introduced into Australia and kill scores of native wildlife, so with each canetoad you kill you save dozens of native animals from being killed. So have some fun and do a bit for the environment at the same time. This photo was taken at Johnos in Cairns, where prizes for the winners included dinner for 2 @ Ricardos Restaurant, Passes to the Cairns Rainforest Dome, Reverse Bungy Jumps @ Cairns Skypark and Sunday Lunch BBQ vouchers courtesy of Lake Placid Bar and Bistro. A good reason to head down there when you get to Cairns! Send us an email if you know of any other places!